From the New York City promotional campaign for IDNYC, its new, inclusive ID program. As the federal government of the United States continues to stall on reforming the existing immigration system, individual states are taking it upon themselves to create new programs and services that meet the needs of their population. Significant media attention has focused on states such as Maryland or California that have issued driver’s licenses to residents without status, or states like Rhode Island and Virginia that allow undocumented college students to pay the same tuition fees as residents. At the same time, other states have been temporarily successful in their ability to profile or target their undocumented populations with the intent to breakdown the community, as best evidenced by the anti-immigrant laws in Arizona. Specifically, Arizona SB 1070 made it a state misdemeanor for an alien to be in Arizona without carrying the required documents and enabled law enforcement agents to inquire about immigration status during a “lawful stop, detention, or arrest,” broadly defined. Additionally, it created harsher penalties for those who sheltered, harbored or transported unregistered aliens. While the federal government decides how the estimated 11 million undocumented individuals currently living in the U.S. will be better incorporated into all aspects of the country, some states are forging ahead with local economic incentives or creating immigrant-friendly school programs. Many argue that states that are inclusive and receptive to undocumented communities benefit in terms of more active civic life, economic gains (especially in terms of return investments on educated youth), and greater community engagement, such as reporting crimes to local police. In more welcoming states, the argument continues, there is more opportunity for all residents to participate in the local economy and community in meaningful ways. One of the most fundamental mechanisms for individuals, regardless of status, to more fully participate in the local community and economy is government-issued identification. Traditionally, individuals with lawful status and a permanent address apply for passports or licenses. These become their “government-issued ID” for everyday activities such as opening a bank account, proving age at a bar, or proving identity. There is of course a sizable population in the U.S. that does not have a permanent address, mainly the homeless or transitional housing population, and they, like the population without status, encounter difficulties obtaining ID. Some establishments are flexible in accepting passports from other countries as a valid form of identification but many are not, which forces individuals without status to avoid any situations that require a valid photo ID. The result is the de facto exclusion of a percentage of the population from a variety of activities that are essential to community and economic involvement. “IDNYC is the new, free identification card for all New York City residents, which gives all of us the opportunity to show who we are — New Yorkers. 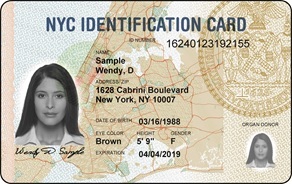 As a government-issued photo identification card, IDNYC secures the peace of mind and access to City services that come from having recognized identification. IDNYC benefits every city resident, including the most vulnerable communities — the homeless, youth, the elderly, undocumented immigrants, the formerly incarcerated and others who may have difficulty obtaining other government-issued ID. To obtain the card, New York residents only have to prove their residency, which can be done through traditional forms such as leases, tax returns, or through non-traditional forms such as medical bills or a letter from a non-governmental organization or church. The city has run a successful campaign to encourage all New Yorkers to apply for the IDNYC, which encourages inclusivity as the card becomes a normalized form of ID (in contrast to driver’s licenses issued by the state of Maryland, which note whether or not the holder has legal status and feature “NOT FOR FEDERAL PURPOSES” printed in bold letters across the front). IDNYC has proven so popular there is already a significant backlog, with appointments to apply for the cards being scheduled months in the future. The IDNYC program aims to incentivize all residents to enroll in the program by offering certain benefits for using the card, including access to libraries and Parks Department space and reduced prices on certain activities such as gyms and movies. Supporters have called the IDNYC initiative an “affirmation.” New York City Mayor Bill de Blasio, who launched the measure, stated, “This ID addresses substantially the notion that we all matter and everyone has an identity.” It is intended to be a confirmation of identity, existence, and meaning, and allow individuals to come out of the shadows and participate more fully in the community and economy. The hope is that routine activities such as enrolling a child in school or leasing an apartment or entering a government building will no longer create fear. It is also hoped that equalizing government-issued identification, without demarcation for those with and without status, will contribute to a reduction in fear and normalization of use. “As the details on the Mayor’s plan become clear, our worst fears have been confirmed. Without requiring fingerprints, or other proper security checks, this will create a homeland security nightmare for law enforcement and the vulnerable civilian population of New York City and beyond,” Ball said in a statement. While the former Senator’s views are more extreme than not, other organizations such as the American Civil Liberties Union are concerned that the program will “amount to a database of undocumented immigrants, putting people seeking legitimization instead at risk of deportation.” There has historically always been a concern with undocumented migrants stepping forward to seek some form of legal relief or identification, best exemplified during the initial implementation of the DREAM ACT in August of 2012. In reality, these programs have not served as centralized database to identify those without status. The IDNYC in particular possesses less of a risk factor because it does not collect or identify immigration status, unlike state-issued licenses. New York City has set an example for other cities and states within the U.S. in terms of creating a more inclusive and accessible community. One of the most important ways to do this is by enabling all residents to have a valid form of photo identification. As the program becomes normalized and more extensively implemented, it will be very important to assess whether it has led to more people using services or participating in the community or the economy. Hopefully New York will have paved the way for other cities or entire states to implement such programs to best address social inclusion and access. ← Are the elderly more prejudiced?